Creatiques Experience :I found Creatiques when I was trying to find a particular dress. I’d fallen in love with a House of Mooshki design and was really keen to try it on. I live in Hertfordshire and I’d never even been to Southsea at this point but decided to make an appointment. I came alone as I had no intention of actually committing to a dress on that day. 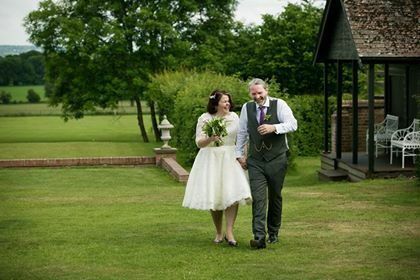 I bought the second dress I tried on (and no, it wasn’t the one I’d fallen in love with which really did not suit me so thank goodness for Kayleigh who clearly knows what suits me better than I do). 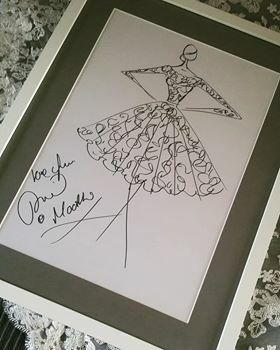 A few modifications later and I left clutching a hand-drawn sketch of my dress courtesy of Mooshki designer, Phil, and feeling amazing. I was so excited to have found THE dress that I was half way home before I realised I now had to have a really awkward conversation with my mother and friends about dress shopping trips! Still worth it. Favourite Planning Moment : So many little moments. Choosing the music (it’s amazing what you can get away with if it’s played on a cello – Metallica for starters), and the reading (and then hearing the laughter as it was read) stand out. I think what really stand out are those moments where we were adding our individual preferences so don’t be afraid to do this your way. 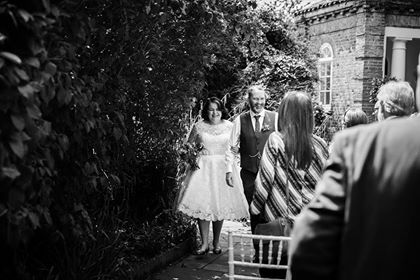 Highlight of the day: A moment I remember really clearly was immediately after the ceremony as we were walking back past our guests. The music we’d chosen started with some fairly general classical music and then morphed into the Bare Necessities from Disney’s Jungle Book (lyrics and all). The music selection was a nod to two really important things for us. First, Paul proposed in Kanha which (allegedly) provided inspiration to Kipling for the novel. Second, Jungle Book was my brother’s favourite film when we were children. My brother died 6 years ago so it was really important for me to include him in the day. It was like a little secret code we’d built into the day at various points and it set the mood for the rest of the afternoon. What would I do differently? I wish I’d changed my shoes earlier. I wanted to have “proper wedding shoes” for the ceremony but I’m just not very good in heels. So I colour matched my heels with new purple Converse and switched shoes for the evening. 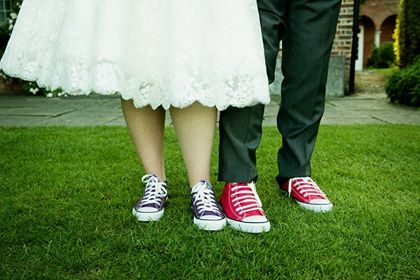 I love the purple heels but those Converse were so comfortable and a great talking point. Top tips Try not to worry about things going wrong. They will and there’s nothing you can do about it. Barring a complete disaster you probably won’t even notice on the day. You can’t control everything so plan the day and then let the professionals do their job. Oh, and wedding cakes are a pain to transport so either pay a professional or be prepared for a very tense (and painfully slow) drive.